Welcome to the Young Volcanoes of Ardèche ! 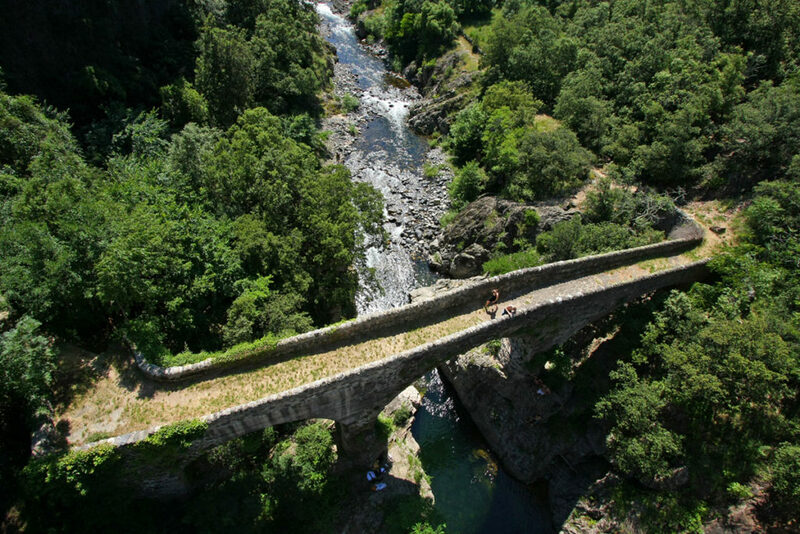 Les Sucs (pointed peaks) and the Young Volcanoes of Ardèche invite you to discover an exceptional area which extends from the Cevennes Vivaroises to the Ardèche Mountains via the Ardèche river valley and its many affluents. Since the Seventies, geologists have revealed the treasures of the Volcanoes in the Ardèche which were, for many years, somewhat overshadowed by those in the Auvergne. Volcanic activity here has carved astonishing landscapes which are particularly representative of this relatively recent geological episode (less than 35,000 years ago). At Pont de Labeaume, gateway to the young Volcanoes in the Ardèche Cevennes at the Rolandy bridge site at the exit from the village, you can locate, at a glance, all our area’s geological, and particularly the volcanic, curiosities (see photo below). 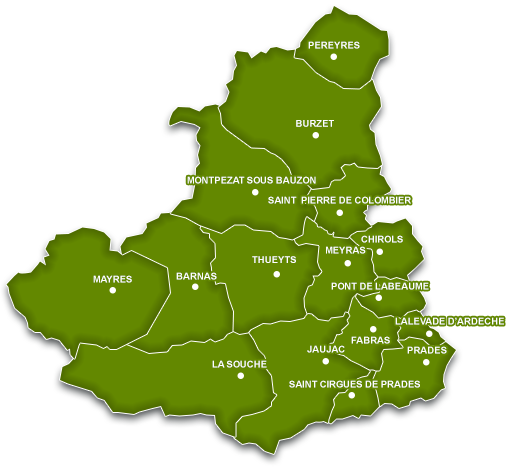 From this site, you can navigate between the zones of slopes and the Ardèche mountains to explore all the volcanic treasures of our region. Columnar basalt above the Lignon stream, classified as one of the most beautiful in Europe: View from Echelette bridge. The Jaujac Bowl is shaped like a drinking bowl. “It is one of the most regular Volcanoes of France, even the most perfect” (Brousse & Berger, 1967, p.3). The cone is typical of Strombolian type volcanoes, primarily built from spatter cones and, to a lesser extent, small lava flows. Some authors believe that at least once during its construction the crater was filled with a lake of lava as traces of solidified lava have been found in the centre of the crater. The basalt flow, vomited by the Bowl of Jaujac, is characterized by the huge forces exerted. In places it is almost fifty meters thick and 3.5kms long. It was probably blocked by the earlier Souilhol flow. This characteristic has led geologists to the conclusion that the flow from the Bowl of Jaujac is perhaps the final eruption of the Young Ardèche Volcanoes. Below the volcano the Peschier mineral water spring was formerly very popular. You can still savour this clear, semi-sparkling and ferruginous water today on the spot. A rare geological phenomenon, the columnar basalt flow on the banks of the Lignon near Jaujac (cliffs of octagonal columns) are a volcanic curiosity, caused by flows of blue volcanic basalt which, when cooling, formed into prism-like shapes. Upstream from Jaujac, the petrified flow is 3.5kms long – a spectacular landscape. The best place to view the columns is from the pretty Romanesque Chastelas bridge. There are columnar basalt flows and limestone rocks with concretions in the immediate vicinity of Meyras-Neyrac Tourist Office. The Maar Doris is a Strombolian Volcano of the Soulhiol. The Souilhol volcano and its two flows as well as the Maar Doris were thrown up by the last eruptive episode which affected the Bas Vivarais. The Souilhol volcano, located on the peak between the confluence of the Ardèche and Lignon rivers, dominates the spa town of Neyrac. It is a breached crater which emitted two basaltic flows. One flow went towards the Lignon and successively filled the Lignon and Ardèche valleys (as far as Pont de Labeaume). The other circumvented Neyrac Haut via a fault in the base. The Neyrac-Les-Bains carbonic gas mofetta. Mofettas are formed by carbon dioxide gas emanations produced by lava cooling below the earth. Rather spectacular, there are only 3 in Europe: The cave of dogs at Pouzzoles near Naples, Royat (Puy de Dome) and Neyrac. The presence of this gas in air is easy to detect: heavier than air, it sinks to the bottom. Unlike oxygen in ambient air, carbonic gas does not burn: any object ignited goes out. There is however a zone above the carbonic gas which is a mixture of ambient air and CO2. In this zone the intensity of a candle flame dwindles. It is only a few centimetres thick and the CO2 content increases the lower you descend. Dans les Offices de Tourisme. Des sorties sont organisées sur le terrain avec des géologues.